In this text you find a collection of track- and pit lane commands. Commands do add functionality to track and pit lane. They do "belong" to track- or pit lane sectors. You find them in the track-tree when "opening" a track- or pit lane sector in the track-data or pit lane-data. The cmds are listed in alphabetical order with more or less description of meaning and arguments. But you also find several tables of content. The library is not yet complete, but hopefully one day it will be. At the end of the text there is a short tutorial of Nic "Swervin Irvin" Prins about how to deal with cmds, inserting and removing. The information is collected from different sources. In the text i tried to give appropriate credits, and i hope i didnt forget somebody (sorry in advance!). In order to keep the document as short as possible i refer to the people with abbreviations. A list of "who is who" can be found in the appendix. All mentioned tutorials can be found in the tutorials section of the track editor homepage. Some of them also can be found on the authors gp2-webpage http://www.asit.ch/~addie/index.html . And every idea of making this document more usuable is welcome ! As this is a growing document, you may want to watch the version number at the top, and the revision history at the end of the file. Paul Arnall, Dan Chinnapen, Vaino Iso-Hannula, Paul Hoad, Martijn Keizer, Adalberto Zapparoli ! 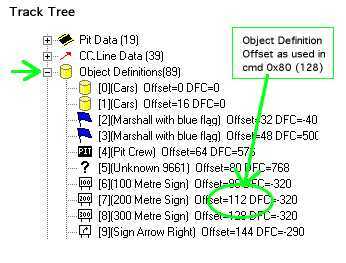 In the track-file you see two tables "Object-Definitions" and "Internal Object Definitions". In the latter the objects themselfs are definied. For placing an object in the track you need to define its position (distance perpendular to the track, height above the track, rotation, etc.) relative to the track in an "Object Definitions"-entry. 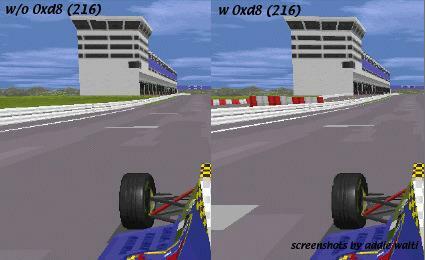 With the cmd 0x80 (128) you finaly place an object definition entry along the track or pit lane. This implies: you can have several object definitions including the same object (but with different rotation and/or position, etc). A very nice example of this can be seen in the Rio-track of Peter L Kessler, where you can see different sides of the same object (pit building) from several track sections. It implies a second fact: you can place the same object-definition several times. This is e.g. handy for adverts. If you have the same advert say three times you simply insert three cmds 0x80 (128) with different offsets. Now how is the object placed in particular ? First we take the value of "Offset Into Sector" and follow the the layout of the track (in the middle of the road!) the appropriate amount, even if we end in one of the next sectors. Next thing is to take the "Object Definition" according to the value of the "Object Definition Offset", there we see values for "Position & Orientation". These values count from where we are standing in the middle of the track (or pit lane). For the "Offset Into Sector" we have track length units. For the values in the "Object Definition" entry we have (probably) track width units. View-distance in Granprix2 means how far away from the viewers position on the track scenery and objects and everything still shows up. The view distance is strickly defined along the track and does not take care on the layout at all. This means if the lanes are crossing (like e.g. in Suzuka) the other lane is not visible anyway, if the distance along the track is too big (as it is in Suzuka). On the other hand, the distance perpendualr to the track does not matter. So view distance must not be imagined as a circle, as newer versions of the TE imply ! The default view-distance is about 60 track length units in front and behind. By the cmds 0x81 (129), 0x82 (130), 0xbe (190) and 0xbf (191) this distance can get increased. The new view distance is valid only at the position where the cmd is inserted. If you move your view-point by e.g. 10 length units, the actual view distance gets decreased by 10 units. If you move on, the view distance gets more and more decreased until you are down at 60 again. Please think about this before going on. Its important to know how this works ! If you also want to extend the view-distance for verges, fences and banks, you have to insert 0xbe (190) and/or 0xbf (191) instead. FA: "These are strange. Do you really think thats the view distance ? (Because occasionally the argument is written over the segments bestline (i.e. cc-line) // maybe some initial value for the cc-line?" See also scenery-tutorial of MK. FA: "These are in fact nothing (just a plain return [in the code]) (0 args)"
maybe debris of f1gp ? For detailed descriptions of the meaning of the cmd and the arguments please have a look at the cmds 0xb4 (180) and 0xb5 (181). With these two cmds the pitlane is attached to the track. The beginning of the first sector of the pitlane is attached to the beginning of the track sector including the cmd 0x86 (134). The end of the last pit lane sector is attached to the beginning of the track sector including the cmd 0x87 (135). see pit lane tutorial for the details. the values of a3 a4 a5 and a6 depend on the value of a2. they are all the same most of the time. a4 sometimes also depends on track widths. For valid values you may want to have a look at those of the original tracks. When used for starting-grid, for the a1-values we have a "base-offset to s/f" of 42, which means we have to insert the three appropriate cmds in a tracksector that has a distance of at least 42 units back from the end of the track. If its exactly 42, we have to set the offsets in the three cmds to 41, 0 and 2 (or 41, 2, 0). With pit lane parking markings, for the a1-values we have a"base-offset to pit lane code" of 2, which means we have to insert the four appropriate cmds in a pitlanesector that has a distance of at least 2 units back from the pitlanesector including the "pit lane code"-cmd. If its exactly 2, we have to set the offsets in the four cmds to 0, 3, 1 and 4. MK: I found that a6 is not your ordinary "length" but more of a code. I got the lines exactly right (in the new tunneltrack) by choosing 257 for a6 (everything else gave results where the stripes where too long) and finetuning on the a3. For a 80-tracklength tunnel, I used 40 dots. Increasing this number thus alters NOT the "density" of the marking, but the length of the marking. The "length per dot" is fixed, and a6 could be some code for it. I tried 80, 258, 259, 261 but that made really loooong lines. PLK: There seems to be a limit on how many times the same track marking can be repeated in a track. I'm working on Barcelona, and I inserted the start line marking onto the back straight. Then I inserted it again in the pits as a speed limit marker, and once more on the exit. When I got back to the real start line, it had vanished. I changed the Length into sector to see if it was covered, and removed and reinserted it but nothing. Then I removed the two markings in the pit and the original one reappeared. I tried this again by inserted the car positioning markers (0x8a - right side only) in the pits, and the ones on the track disappeared on the right only. I didn't notice any effect, but the number of arguments is 2. Not 1 as said in cmdlib. "there are in fact nothing (just a plain return [in the code])"
I haven't seen in the code, but I have just tried it in track. With 1 args, track is crashed, when loading, but with 2 args is works fine. FA: "These are in fact nothing (just a plain return [in the code]) (1 args)"
These cmds are not available in TE of PH version prior to 1.8.7 and TE of VIH prior to 0.040. NP: These two commands are used to set the start position and the length of a kerb on a track sector/s. 0x8e is used for kerbs that appear on the left hand side of the track, and 0x8f for the right. These commands will only work properly on type B (0xcb defined) kerbs. With a type A kerb, when you set one the kerb will run for the entire length of the track sector. The only time when a type A kerb will need one of these commands is in the rare instance when one of these kerbs will not appear when you set one. For type B kerbs, how far the kerb will run along the track sector can be changed by these commands, and it is far more common for these kerbs to not appear when you set one, and these kerbs can be 'forced' as well. When you place a 0x8e (left) or a 0x8f (right) command on a track sector with a type B kerb, this value defines where the kerb will begin within the track sector, in the units as track length. If type B kerbs are set in the following track sector, on the same side, the kerb need not start in the track sector the 0x8e/f command is set in. This is simply how long the kerb will run for from the start position. If you want a kerb to be longer than the track sector, set type B kerbs for however many following track sectors you want, and control the exact length using the command. This is good as it means that you don't need to set one of these commands for each of the track sector. 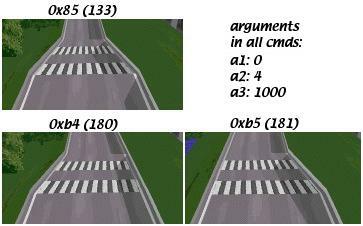 Forcing kerbs is done by the 0x8e and 0x8f commands. Quite often when you set a type B kerb for a track sector, the kerb won't appear. What you will need to do is to the find the closest track sectorbefore it, that will accept a type B kerb on the same side of the track. It doesn't matter if you don't want to have a kerb appear here, because it doesn't need to. Now make sure you have a type B kerb set in the track section where you want it, and in the one before that will accept it. Now place a 0x8e/f command in the sector that will accept the kerb. Take the distance >from the start of this sector to the start of the track sector where you want the kerb. Use this value as the Start Position value. Now you can make the kerb as long as want, remembering that if you want to make it longer the track sector, to set kerbs in the following track sector as well. RP: I have done some research to kerb placement and discovered some things I didn't knew before. When setting a 0x8e or 0x8f command, this command applies to the rest of the track, or until another 0x8e or 0x8f command is found (not just one kerb). * A kerb of this type can be only one segment long. * When the segment is curved, it will go from the start of the track to the end of the track. * When the segment is straight, it will follow the rules of the 0x8e (or 0x8f) command; it will start at the a2 value and runs until the a3 value OR the end of the track-segment when a2+a3 is bigger than the length of the segment. * When the a2 value is bigger then the length of the segment the kerb will not show up at all (of course unless the segment is curved). * A kerb of this type always follows the 0x8e/f command. When you apply a kerb before a 0x8e or 0x8f command is given, GP2 will use a 'default' command with a2=1 and a3=12. FA: "Probably something in relation to bestline [cc-line]. 1 arg, some backward reference." FA: "Probably something in relation to bestline [cc-line]. 1 arg, some forward reference." PKA: "0x90 / 0x91 are visability codes too, turning off unsightly errors in the original tracks,"
Effect is ?. I think it has same kind of effect as 0x90, 0x91, 0x92, 0x94 or 0x95. Because all those are unk. Probably it is connected to 0x92. In cmdlib is said about 0x92: "possible scenery". I tested this cmd with "no-scenery" track, so I can't say. But it is possible, too. This cmd is not available in TE of PH version prior to 1.8.7 and TE of VIH prior to 0.040. At least they have nothing to do with grip value nor with skid marks. With these two cmds you define the speed limited zone in the pit lane. see pit lane guide for the details. NP: "When you place a 0x98 or 0x99 command in a track sector, this section and those following it will be of the height specified in this command, from the beginning of this track sector. The transitional height will be in the preceding track section. By that I mean that if the wall height was two and you insert a command to change it to three, the track sector that you place it in will have a height of three from start to finish, but the track sector before it, will have a height of two at the start and a height of three at the finish." this cmd defines the offset of the visible pit lane start to the beginning of the track-sector with the cmd 0x86. But the ACTUAL pit lane beginning is at the beginning of the track-sector with 0x86 anyway ! In GP2.exe there seem to exist a slot-specific (f1ct01 is slot 1, f1ct02 is slot 2, etc.) value that defines how far away from THE VISIBLE pit lane-beginning, the cc-cars start their pit lane-approach. I didn't notice any effect. I think that those two commands are used in the pitlane because cmds around it are. Maybe first for entrance and second for exit of pitlane? Or one for left side pit and other for the right side? The value of a1 has to be smaller at least by 2 than the rest of the pit lane. Smaller by 1 and greater gives you gfx-bugs. If the value equals the rest of the pit lane, the track hangs gp2.exe. Sometimes gp2.exe also hangs when the value is greater. BK: The 0x9e command tells you how far the yellow lines extend on exit starting from the start of the sector in which 0x9e appears. This is why it is generally a few units short of the rest of the pit lane length. 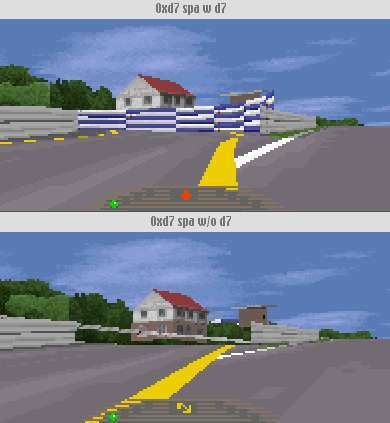 But even if the visible part of the pit lanes ends before the actual end of it, the computer cars do not go onto the racing line until the actual exit. MK: The value [of 0x9e] was greater than the actual length of the remaining pit lane, making it end suddenly. see also pit lane guide. this cmd is included in the first pit lane sector with its own fences. used to initiate the connection of pit lane fences and track fence. this cmd is included in the first pit lane-sector beyond the box without its own fences. These four cmds are used to connect track fence and pit lane fence. You always connect the BEGINNINGS of the fences. 0xa1 and 0xa2 in the track are the "counterparts" of the 0x9f in the pit lane. 0xa3 and 0xa4 in the track are the "counterparts" of the 0xa0 in the pit lane. In cmdlib: "this sets a bytevalue within gp2.exe" (FA). What is this bytevalue? Well maybe it sets some bytevalue, but does it have effect on the track? FA: "this sets a bytevalue within gp2.exe"
FA: "0xa6, 0xa7; (2 args, 1st arg = number of segs, 2nd arg = idx into gp2 internal tab?)" 1/track, in one of the last sector. usually short before the s/f line becomes visible. when in the last lap of a race the leading car passes the track-sector with this cmd in, the marshalls begin waving their flags. Seems to be a pitcommand (nowhere else found) and it is always found in p0 ! FA: "0xa9 sets just a bytevalue within gp2 (1 arg)"
not in every track. but if it is there, there are always two of them in t0. PH: this cmd sometimes appears in t0 of the track file. because of the structure of the track file it follows directly after the "Untextured Kerb Colors". Looking at the cmds arguments i'm wondering also if the cmd 0xac might not also be a coloring cmd ? this parameter is not used in the original tracks. it also seems not to be finished. a3: Height; (of the banking); about 1000 give a nice banking, +ve is for left banking, -ve is for right banking. You'll have to insert two commands in two different sectors. GN: To add banking, simply select the required track section and right-click. Choose ADD TRACK COMMAND and in the dialog box choose command 173 (0xad). You can then add in the length and degree of banking. I have found that values between (-)1800 and (-)3200 are good for the banking. Length is self-explanatory and there is a third arg which is unused and should remain at zero. MK: Well basically banking is the simpelest of adjustments one can make (that says something about the rest...). Insert the command before the corner, insert the values and the banking is done. After the corner, insert another banking command to get the track straight again. The first value is to define how long the transition is from zero to full banking. The second is to define how much banking you want. For the first corner on the SepaDelft track (get used to the name...) I used (15,1000) as values. For the un-banking, the second value has to be 0, the first NOT zero, because there will be a threshold otherwise. I used (15,0) as you can check easily. Positive values give a banking with a higher left, negative values gives banking with a higher right side. The banking seems to have a real effect on the grip of the car, despite the fact that it is not a very much developed command. That is shown in the fact that the CCars are drawn like they are riding on a flat surface. They are no doubt uninfluenced in their grip level. The track itself is the only surface that has an actual banking drawn. The grass on the side and the armco are untouched. That means that if you go off and hit the armco, the armco will be meters or feet underneath you. Therefore, banking should be applied lightly and not too steep. Experiment if you don't believe it. Totally mystery! I couldn't find the number of arguments. First it seemed that it has 2 arguments but no, 7 worked, but it made the track heights messed. I think that this command has sometimes been, but it is now totally out of use. 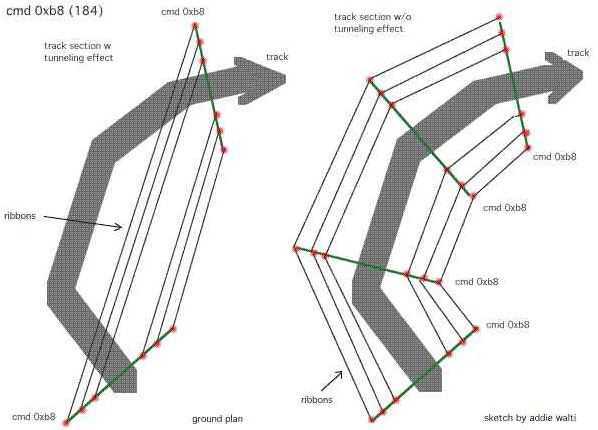 This cmd defines position and angle of a pair of swivel-arms for the scenery-ribbons, one for the left side and one for the right side of the track.The cmd 0xaf (175) is always followed by a cmd 0xb8 (184) that defines the x- and z- coordinates where the scenery-ribbons are attached to the swivel arms. In a single track-sector there can also be several pairs of 0xaf/0xb8 them with different offsets in cmd 0xaf(175). See the following pictures for an example. All three screenshots feature exactly the same clip of a certain part of a track. There are three "arms" visible. One at the left side, one at the right side and one in the middle. The only difference between the three images is the angle value of the middle "arm". In the top image the value is 16384 (its a right arm; left arm would be -16384). The value in the middle image is 20384. The value in the bottom image is 12384.
for more details on the angle value, see compass chapter in glossary. MK: "This command is to switch off a ribbons and/or banks." For switching them on, use 0xb9 or 0xd9. When you see it, you will recognise it. Its a floating line starting somewhere around the border of the iamge leading into the "helmet of the driver". I thought that it has same kind of effect as 0xB2, but I didn't notice any effect. I used it with poor track (no scenery, no track markings, not many objects), so all effects may not be seen. But I believe that it some effect! I made a little research about unused track commands. 0xB2 (178) is not used in original tracks and I think that is reason, why those commands is not explored. At least within the last year. 0xB2 has 2 arguments. I don't know what the first argument makes (maybe nothing as usual). I found that second argument a2 has an affection. It has slitted in bits as 0xB0. But I noticed that only first two bits are used. Bit 1: turns off the left boundary line. Bit 2: turns off the right boundary line. 3 turns both lines off. Cmd 0xb5 (181) Track Width Change Right"
"All of these operate on the same principle. They each have 3 args and the values are interchangeable between the three commands:"
"Arg (1) is always unused and should remain 0 (zero)"
"Arg (2) is the value which specifies transition length: just how long the command takes from when it starts (always at the beginning of the track section into which it is inserted) until the track has been change to the new value. As far as I know, any value >from zero to the total length of the circuit can be used (although any further width change commands in the track will interrupt this). Usually you will want a value of between 10 and 30 as this is the distance in track lengths that the command will take to be completed. It will produce a smooth change from the old width to the new one, with no sudden jumps. " "Arg (3) is the value which specifies how much the track width changes. The standard track width seems to be around 1450-1525 (check the earliest sections of a track to make sure), so if you want the track to become broader, enter a higher value, something between 1550 for a minor change or 1800 for a bigger change. For a track like Burke Lakefront Airport, something like 2200-2600 might be better. Alternatively, lowering the value to something like 300 will give you a bicycle path, useless for cars (unless you're James Bond!)" "With Cmd 0xb4 (180) / 0xb5 (181), width changes will only occur on one side of the track. With Cmd 0x85 (133), both sides of the track will change to the new value. As an example, you might want a tight right-hand corner of the track to be wider on the outside. Go to a track section *before* the corner (about 10 or 20 track lengths) and enter Cmd 180 Track Width Change Left. The first value, arg (1), will be zero, the second, arg (2), will be between 10 or 20 (depending how far away from the corner you are), and the third, arg (3), will be a value higher than the previous track width command (you'll have to check this - all tracks are different), probably around 1600. If you want a much more sudden change of width, say for a bridge, enter arg (2) as zero and arg (3) as a value about 100 lower than the previous width command." Its three times the very same section in a track. The first crosswalk marks the beginning of the tracksector including the track-width-change cmd. The "Length" of the crosswalks are 1 each. The width before the change is 1800 on both sides. Note: As PLK mentioned above, it does not matter what value is set in a1, the change of width always starts at the beginning of the sector including the track-width-change cmd. Transition is not limited to the starting sector, its possible over several sectors. Last question: where is the inital track width ? Answer: it is in the track-config-section of a track. Its not known why the TE of PH does not show it, but its there and working (author checked with hexeditor). TE of VIH shows it. "Last I did this I just inserted the trackwidth command in the first track segment. Worked for me." MK: "I think the a2 is the "transition length", look at the s/f straight in Japan where, before the first corner, the track narrows gradually. The value indicates the track length used to perform the narrowing. And changing the arguments of this cmd does NOT affect the cc-line." " 0xb4, 0xb5, 0x85: this command is way more complex than it seems: setting this value VERY low (~15) scales for instance the walls also, so that they become very close to the track. Even if the verge-width is around 250, the walls are still only inches away from the actual track (/trail). I'm not sure whether this affects scenery also. A nice idea may be to calculate the multiplication of 0xaf (175) with the trackwidth at all points, maybe there's a connection." "*Perhaps* 1024 units = 16 feet, about 4 metres. This scale is used in the objects (like adverts etc). Seems a little too small though, for my liking. Perhaps it's twice that (for both left and right), then it starts to make sense!!!! BTW the "trackwidth" is more of a "global scale" that affects the verges too, although hardly noticable when useing "normal" verges. But if you have a track width of 2, then the verges are ALWAYS near the track, even if the supposed distance is 250." I have tested these formulas and they are highly accurate." I tried this command first at track (t01) and then at first sector in pitlane (p00). There were no visible difference. I found that positive low values turn pitlane start angle to left and negative to right. My pit was on the right side. I found that if used values above +/- 300 angle was decreasing! I haven't yet tried this with "real" track. I tried it with my test track and when pitlane start angle was changed GP2-engine twists track so that end of pitlane connects to the track. That's what I know up to now. This height value is very strong. Value 10 gives about 20 degrees. I don't know more yet. Command to define the scenery structure. The "scenery" consists of bank-left, bank-right and four ribbons. Whether the ribbons are on the left or the right side can be set up. a2: valid values 0..4 basically it gives the location of the track within the 4 ribbons. You can also refer to it as "the number of ribbons to the right of the track"
Origin of x- and z-coordinate is the middle of the track. This is the famous scenery-ribbon-cmd. It defines the basic scenery, together with the swivel-arm-cmds 0xaf (175), 0xc0 (192) or 0xc1(193). You have them allover the track and alltogether they define the shape of hills, forests, meadows, dunes, whatever. The maximum number of cmds 0xb8 seem to be 128. If you insert another one, the very last of them in the track gets lost. As mentioned you never see the cmd 0xb8 standing alone, there always is another cmd BEFORE it, a cmd 0xaf(175), a cmd 0xc0 or cmd 0xc1. The latters do define the position and some angles, and 0xb8 defines the structure of the scenery. It is important you understand the meaning of argument a2 "ribbons to the right". With this argument you adjust on which side of the road you want the four ribbons. The banks always remain on their given side, but the ribbons can change their side. Normally you may have 2 on each side. If you want 3 on the right side you set a2 to 3 and the most left ribbon becomes the most right one. But beware, the labeling of the coordinate-pairs is only valid, if you have a2=2. Whatever number of ribbons you have on each side, the labeling of the coordinate-pairs always goes from left to right. So if you e.g. have all ribbons on the left side (a2=0) then a9/a10 of the image above becomes a13/a14. 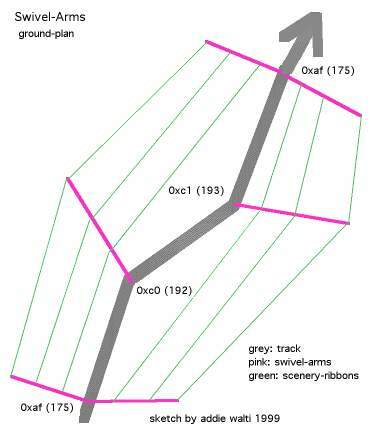 The numbering of the ribbons start at the right side, right after the bank. After the last ribbon to the right it switches to the very left ribbon. In the next image we see a common problem we have to face after changing the layout of a track. Although its simplyfied, it shows the basic idea. MK: "With this cmd you can "turn on" individual ribbons and/or banks depending on the value in argument a2. The ribbons are showing up no matter what detail level is set in the game (in opposite to 0xd9)"
Do ONLY insert this cmd at the same position as a 0xaf/0xb8, 0xc0/0xb8 or 0xc1/0xb8 pair. (see original tracks for reference). See 0xb0 for an example of a gfx-bug that can happen when not following this rule. MK: This command is used to force the scenery to "shortcut" the track. When scenery is made in a curved tracksection, normally the scenery follows the curvature of the track. When this command is used, the scenery makes a shortcut, thus following a STRAIGHT line between two scenery-connection points (0xB8 cmds). Note that the scenery5 command is a SWITCH that can be set for some part of the track, and some ribbons using the location code. The a2 value (and/or a3 value) indicates to which ribbon- locations the command is applied, you can thus force individual ribbons to shortcut. Normally, you use this only on the INside of a corner. MK: "OK, OK, maybe it's by default "straight", but then switch it to "round" by placing one of those commands. It's a switch." a5 - number of repeats within length (this last value should always be balanced as a rounded proportion of the length, ie length 12 number 4, otherwise the last repeat can be cut off). It's hard to see why this command exists, as it is only used once in f1ct05, and I have not seen it anywhere else as yet. with this cmd we do define an area, where a texture gets mapped. first we define the size of the area, 2nd we select the texture and define how it gets mapped on the definend area. we define repetition horizontal and vertical, rotation. if this shift is somewhat greater than 0 and less than the vertical resolution of the texture, then the texture gets shifted upwards by this amount. that means the upper margin gets cutted and pasted at the lower margin. a8: Rotation; (of the texture in steps of 90degrees. common rotation values (to avoid distortions) : 3 (0 degrees), 19 (90 degrees), 35 (...), 51, 67, etc.). MK: When applying a texture to a fence/ribbon/bank/verge, it may be upside down, or wanted upside down or turned. The code to do this is the arg8 - X angle, with codes 16,32,48 respectively, for 90-180-270 degrees rotation. (cost me some time to find out, typing 90 the first time, when you KNOW you are working with computercode, is quite stupid. The Doom-editing I once did helped me remind that EVERYTHING goes in powers of two.) The interface box on this command is pretty bad in 156, almost all changes are not working. Instead, I use the properties box which is difficult because the textures have no names, the places are just a number and so on. Not too difficult, but maybe more of a hint to Paul Hoad. Seems like a little bug in the TE. Also, the nrows is the number of rows of pixels on the bitmap that is mapped. Not the number of mapped bitmaps that you want on your ribbon. For example, for a regular advert, the number of pixels (nrows) is 16. On the other hand, the nbitmaps command IS the number of times you want your bitmap placed on the ribbon. For example, a fence with length 20 and only one nbitmap, give a very stretched-out advert on the fence. I use an average of 1 advert per 4-5 units of length, which looks OK to me. Beware of the short adverts (like Castrol) because they will be very streched out. For example, if you want to use only the lower part of texture 36: Normally, the mobil advert is included in this texture. (look at por2.jam) and this advert is on the top, 20 pixels high. The whole texture is 32+20 = 52 high. Now we want 32/52 part of it to be seen, this is 0.61. This is (almost) 10/16, so I insert the values nrows=10 and y-offset = 20. Get it? JV: "When dealing with additional tarmac textures you may want to try different values of a6. E.g. in Monaco it is 8 and in Silverstone it is 16." PLK: a2 is definitely a rotational value. The sun in Portugal has a value of -3640. In the track I'm working on now, objects which face me while I exit the pits where in deep shadow. I changed the value to -18640, and the sunlight had turned around (anti-clockwise) to light up these objects. For a brief introduction in the subject "View-Distance" please have alook at the old view distance cmds 0x81 (129) and 0x82 (130). If you insert a cmd 0xbe (190) or 0xbf (191) and set a3 to a value smaller than 60, the view-distance remains about 60. If you set a3 greater then 60, the view-distancegets increased to the specified value. If you set a3=100 the view-distance is 100 track-length units. In opposite to the old view-distance-cmds 0x81 (129) and 0x82 (130) you can define what should show up in the extended view distance. With a2 you can do this. Road and ribbons show up always. With a2 you can also enable the other locations. So if you e.g. set a2=19 the following locations show up: road, ribbons, verges and left bank. It looks to me like you only need these two cmds to set the view-distances. But in the original tracks these cmds are always inserted together with a cmd 0x81 or 0x82. IF the are inserted as a pair ALWAYS the view-distance is set by the old cmd 0x81 or 0x82 and the location is set by the new cmd 0xbe or 0xbf. This means a3 of 0xbe gets overridden by a2 of 0x81 and a3 of 0xbf gets overridden by a2 of 0x82. If you want to go beyond a range of 255 you may need to work with cmd 0xc5 (197). These cmds define position and angle of a single swivel-arm for the scenery-ribbons. The x- and z- coordinates of the scenery-ribbons are defined in the cmd 0xb8 (184). 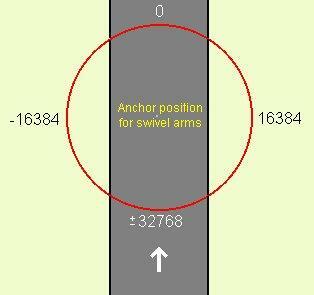 For extensive description of the meaning of swivel arms, see cmd 0xaf (175). MK: 0xc3 �bridge scenery command� ?! The cmds 0xc5 / 0xc6 are used for defining "Far-View". To understand the necessity of "Far-View" you have to understand the limits of the "View-Distance" concept. For descriptons of the "View-Distance" concept see cmds 0x81, 0x82, 0xbe, and/or 0xbf. There you see the View-Distance is limited to a distance of 255 track-length units. In long straights or twisted tracks, or tracks with crossings it can be necessary to have a greater view-distance. Thats when 0xc5 together with 0xc6 come to play. In the following image we see a clip of the Bern-Grauholz track made by the author. This track features a crossing beyond the "regular" view-distance. The cmds 0xc5 and 0xc6 make it possible to see the cc-car on the bridge. The figures in the track-sectors are distances from s/f ! We need to insert both cmds in the same track-sector. In the example above, the cmds are in the track sector at distance 125 from s/f. 0xc5 at first (or more than 1 of them), 0xc6 afterwards. With 0xc5 we define what part of the track should become visible. We define this part by giving the distance from start s/f. In the above example we insert a2= 538 and a3 = 548 for defining the section visible where the bridge is. Of course we have to take care of the heights when making an arrangement like this ! There are two more arguments from interest in 0xc5. With a4 we can define what parts of the scenery should become visible. With a8 (if available) we somehow can define the periferal angle of visibility of the far-view-section. Its not yet clear how this argument works in detail. A possible approach could be: imagine a line from your head (point of view in the game) to the "far view"-section. This is zero degrees. Now imagine you turn your head. This is periferal angle. 0, 90, 180 and 270, all +- about 20 degrees seem to be visible all the time (e.g. at a8=0). With increasing the value of a8 you can "fill up" the gap. However you may want to check out several values for getting the best result. Once the far-view-section is defined, we have to "open a window" by a cmd 0xc6. More: 0xc5/0xc6 is not only useful for defining and enabling far-view-sections. It is also very useful for defining and enabling "rear-views" ! Imagine a hairpin. When you approach the hairpin you have the whole section in front of you. Then you turn in. When leaving the hairpin you see the road ahead of you. But you also should be able to see the road that approaches the hairpin (where you drove a few seconds ago). But in gp2 its not possible to look forward and behind at the same time, and the mentioned section IS behind, although you see it in front view ! Thats where you can use 0xc5/0xc6 also. With 0xc5 you define the part of the track you do not see now, and with 0xc6 you define a window in front of you. In some original tracks this cmd has 7 args, in other original tracks it has 8 args. The switch for the number of arguments is to be found in the track config section, track-sections, in the same place where you find the pit-side-switch. The TE ALWAYS inserts 0xc5 (197) with 8 args when rightclicking a tracksector in the track tree and choose "insert track command"), whatever the switch is set to. So if the switch is set to 7 args and you insert a cmd 0xc5 anyway, your track is lost ! (save and load it to see what i mean). If you want to set up some far view areas, you may want to work with the cmds with 8 args, because a8 is a very useful argument. If your track features only cmds 0xc5 with 7 args, you can change this be deleting ALL cmds 0xc5 (197), then setting the mentioned switch to 8 args and then inserting new cmds 0xc5 (197). This works well, i tested that. But you may want to make a backup of your track anyway before trying it ! As the watchful reader already noticed, basically its adding 512, which means simply setting the 0xc5-flag. "I found a solution. I told you it was leaking through with the far-view window I set up there. So I decreased the length of the window, and it disappeared. But there are some more things to say about. First, I had a far-view that went on until exactly the finishline. It is not possible (as far as I have seen) to get the entire area around s/f in one window, so you either have the last part, or the first part of the track. And only one window is active at any time. Second, I have seen the "flying armco" before, coming from objects.The "Flying Armco" goes from the point where the problem is, to the "disapperaring point" in the middle of the screen, on the level of the horizon. Like it was infinitly long. On these objects, the reason for the "F.A", was that I made one or more "polygons" length zero. For instance, by putting two vertices on top of one another (in 3D) which gives the connecting line a length zero. Or by setting one of the scale-units length zero. Anyway, GP2 doesn't like that sometimes, and perhaps by some division operation, instead of zero, the length of that section becomes infinite. Point is, I couldn't find an object with any length zero there. But perhaps the fact that I made the far-view window get up right untill s/f, made a similar division-problem, and thus the error. By cutting the window short by 4 units, the problem disappeared anyway." in which you see the "window-stuff". *0x81 / 0x82 be/bf don't have any influence if there's a c5 code in the vicinity." DC: "Strange flashing switch in view could have something to do with using 0xc5 values that span the start/finish, i.e. the end and beginning of the track. I found that if I used values that stopped just before the end of the last inch of track, the walls no longer flashed. Also, when I used values that started at the beginning of the track and ended where I normally ended the view, this second scenery bug was fixed. Now the problem is that it is hard to string together 2 or more of these commands without making the view look poor, like one section switches on when another switches off when you pass a point. Also, when I make a third command that spans the small area on either side of the S/F straight, this small area flashes." "Oh yeah I forgot, if its not already known, Cars and Objects are always seen with his command, even when A4 = 0. " 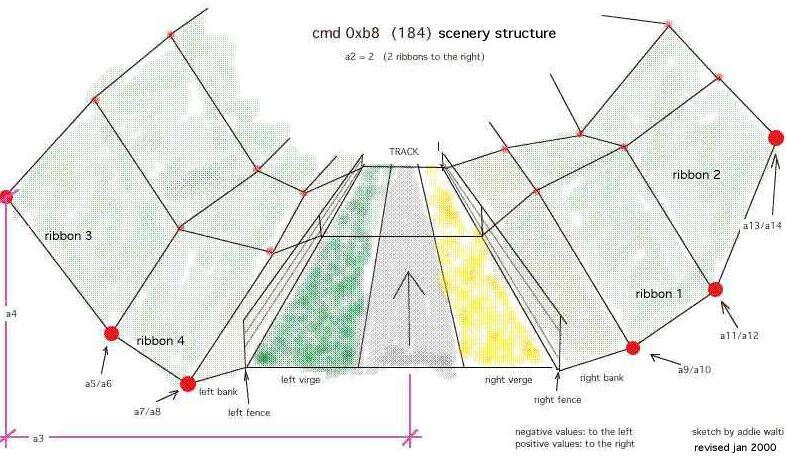 LD: "0xc6 seems to work much like the 0xdb (219) "Show Pits Through Ribbons" and/or 0xd3 "View Into Pit Entry". I had to put the 0xc6 into t107 of Van Indy, screwed up the fences a little, but it was a compromise between Not beeing able to see into the pits, or some weirdness with the fences." BC: "I also discovered that if the sections specified in the Oxc5 and Oxc6 commands overlap, when you are in the overlap section, nothing shows up, not even objects! What I am referring to is in the Oxc6 commandd, the values define the distance that the Oxc5 is inacted. The Oxc5 defines the distance from the S/F line. So, if those two sections overlap, that is where everything shuts off. For people using tracks with oxc5 and Oxc6 commands such as Imola and Spa, if you leave these commands in, it could cause these sort of problems if you are substantially revising the track. I also experimented with multiple Oxc5/Oxc6 combinations. What happens is the last command is the one recognised." 0xC5, 0xC5, 0xC5, 0xC6 in order. I found that the last one works too, but only for objects, I think. So, an object would not show up unless it was in the last C5. In Monza, trying to fix the view of the S/F straight, I have to split it into 2 commands, since there is a problem of using 1 command to go past the start and end of the track. Since the pit building is defined in the last sector of track and corresponds to the first C5, the building does not show up. For the overlap, you mean when C6 value lies within the values for a2: and a3: of 0xC5? " BC: "Yes. Since the A2 of the Oxc6 command determines the distance from the point of the command that the Oxc5 section defined is visible; if the area defined by the Oxc5 is within that distance, then that is the point where everything shuts off. Since the Oxc5 defines the section as distance from the S/F line, it is not so obvious until you actually drive." It was MB who originally turned my attention to the 0xc5 cmd in the original Imola track. a8: Rotation; (of the texture; in steps of 90degrees; common values: 3 (0 degrees), 19 (90 degrees), 35 (...), 51, 67, etc.). This is the scenery definition command that defines what the default textures will be on the left and right floors and sometimes left and right fences, as you already know. There are still a number of unkowns which I've managed to work out. I found that this command is closer to the 0xbc command than was thought. As in that command, Arg(3) is the length, but here it means the length that the texture is drawn on, and then this length is repeated x times over the total length of the track, x being track length/length value. Arg(5) is the number of times the texture is repeated over the length value in Arg(3). Arg(6) is the number of rows displayed. Arg(8) is the x angle as well. Arg(1) I'm not too sure about, as I couldn't really see any difference from the small change I made to it, so I'll get back to you on this one. You would assume that Arg(7) is the y offset as in 0xbc, but I didn't test this. NP: These two commands define the charcteristics of the two kerb types; A and B. These two commands appear only once each in in every track. Once again, for all tracks except F1ct16.dat, these are found in track section zero. For F1ct16, they are found in track section 6. It actually doesn't matter where within the track these are, but there's no need to move them anyway, so don't bother. If you place a second 0xca or 0xcb kerb command somewhere into the track, this will basically overwrite the existing command, such that kerb characteristics of this kerb type for the entire track will come from the new command, not the existing one. My advice; don't add, or move 0xca and 0xcb commands. You'll just confuse things. a2 : Profile - the cross-section of the kerb. Affects, and is affected by, height and width values. a4 : Height at Track - How high the kerb will be at the track edge. a5 : Height on Verge - How high the kerb will be at the edge fartherest from the track. We'll leave the Profile till last, as it is the hardest to explain, and your width and two height values will change how this works, so we'll start with them. This is simply how wide the kerb will be. possible values are from zero to 500+. I say 500+ because I've never gone any wider than this and for existing (real) Formula One circuits, this is about as wide as kerbs get. Interlagos, in Brazil, for example, has very wide kerbs, which would be about 500. Just remember, that when you set a very wide kerb, unless you adjust the CC-line (hard), or mess around with the track widths(relatively easily, explained elsewhere in the tutorial), you, the human driver, will be able to make full use of them, but the CCs won't, which will be in your favour, obviously. a4 : Height at track. This value sets how high the kerb will be where the kerb meets the track. The idea of the profile value (a2) is to move this height between the track edge and the far edge, but more of that later. The possible range of values for this range from zero to 32+. 32 is the highest value that you'll find in the original Microprose tracks. Trust me, I don't think that you'll seriously want to make this any larger; 32 makes a big enough kerb as it is. This value sets how high the kerb will be at the edge fartherest from the track. It is in the same units as a4. Possible range of values are the same as for a4. Contrary to what you might think, this value does not necessarily have to be the same as or greater than a4. With clever usage of a2, the profile, you can do this and not get a strange looking kerb. This value remained unknown up to and including TrackEd 1.56. I discovered it a few months back, but it was only now (as I was typing the Height at Track explanation, in fact!) that I have an exact explanation for it. The function of this value, is to define how far from the track edge the Height at Track (a4) will be. It sounds funny, but trust me. The best way to look at this is in a two dimensional, x-y axis system. In this system, Kerb Width (a3), and Profile, are x values. Both kerb heights, therefore, are y values. The origin of this graph ((0,0) - where the x and y axis meet), is the point where the edge of the track meets the kerb. We will consider a kerb on the right hand side of the track. For a left hand kerb you would just mirror the graph. Let's say that the kerb width is 300, the Height at Track is 20, and the Height on Verge is 30. Now when the Profile value is set to zero, the graph, which represents the cross-section of the kerb, will look like this. As you can see, from the origin, the kerb will rise vertically to a height of twenty. From here, the top of the kerb will go to the point (300,30), which is the end of our kerb. The line drawn from point (0,20) to point (300,30) is not a straight line. GP2 will always give this line a small, positive curve. This means that this line has a hump, or rise in it. This is just to smooth things out so to speak, and it is not possible to alter this. Going back to the graph, you'll see that the kerb created is undesirable. No kerb I have seen has such a large vertical edge to it at the track edge. Now let's do the same thing again, but using a Profile value of 20. You'll notice here that the profile value has moved the Height at Track value 20 units to the right. The kerb now begins at the origin, then rises to the point (20,20). Once again, this line is not perfectly straight. As before, the top of the kerb will then go from this point to the verge edge, namely point (300, 30). As you can see, we now have what you would consider a proper kerb. You can probably work out for yourself that by making the Height on Verge larger than the Height at Track, and using a good profile value, you can make a kerb which rises from the track edge, and then falls away from the point (profile, height at track) to the verge edge) and still have a 'normal' kerb, as I mentioned previously. The Profile value is in the same units as Kerb width (Arg 3), and you can actually make this larger than the width value. However, if you do this, you'll notice that kerb is rather stupid looking, so doing this is not practical. So a3 "zooms" horizon. I found that the default value (no 0xcc commands on track) is between 600-650. It's hard to know exact value. Maybe 640. Low values make horizon smaller and high bigger. If used 0, there is no horizon. And 1280 (or near) dublicates the size of horizon. Lights up or darkens the textures. a4: Light Up Or Darken Factor; MK: seems to be between 0 (dark) and 15 (bright). In this example the cmd 0xcd (205) is used to lighten up the frontwindows of the massenet-hotel. Or in technically terms: to lighten up the texture on ribbon 4. DS: It occurs only once in f1ct04.dat, Monaco. It appears in t68, the sector just before the tunnel. Its argument is (4). Removing it caused the tunnel roof section bleed through the right building wall as seen from portier corner. LD: "Its just another scenery cmd. seems to be assigned to a ribbon. a2= 4 means assignement to ribbon 4"
DS: It always appears in track sectors before the start of the pits. Usually at some distance. However the second argument always covers the whole of the track upto or just beyond where the pit fences begin. My conclusion is therefore to allow the pit building and pit objects to be seen at a distance through the pit fences but not through the track fences. There are two arguments to this cmd. The first i believe is the offset from the position of the track where its located. The second marks the distance at which the cmd has an effect, and i believe in theory could run for as long as the track. Its use appears to be to allow objects to be seen through or across fences. Aside from this observations it would appear as a bug if used in the wrong place. The loc code looks to me like type D rather than type A ! PH: "I also notices that the 0xd0 commands seem to prevent scenery panels flashing, but I didn't do anymore experimentation here." (see f1cts 02 10 15 16) 1/track in one of the last track-sector ? By the help of this cmd, the pit lane entrance becomes visible if you have not yet entered the pit lane. As soon as you have entered the pit lane it becomes visible anyway, but as long as you are outside, visibility (view distance) depends on a2 of this cmd. The pitcrews do not get visible. This cmd works similar to cmd 0xd3, but with unlimited view distance. As soon as you pass this cmd, all pit lane is visible from the track. f1ct12 (monza) is the only original track where you see from the entry "through" the pitlane to the exit. Thats why this cmd is used but there. If you use this cmd at the entrance, you also have to use cmd 0xd6 (214) at the exit, et vice versa. You may experience gfx-trouble (e.g. pit lane armco bleeding in regular track) if you use these cmds in pit lanes that are not all-straight. By the help of this cmd, the pit lane exit becomes visible if you look into the pit lane from the wrong end and have not yet entered it. As soon as you have entered the pit lane it becomes visible anyway, but as long as you are outside, visibility (view distance) depends on a2 of this cmd. The pitcrews do not become visible. For further descriptions see pit lane tutorial. This cmd works similar to cmd 0xd5, but with unlimited view distance. As soon as you pass this cmd, all pit lane is visible. f1ct12 (Monza) is the only original track where you see from the exit "through" the pitlane to the entry. Thats why this cmd is used but there. PH: it simply stores the position of the sector in which it appears which might mean that it may be trigger for something. 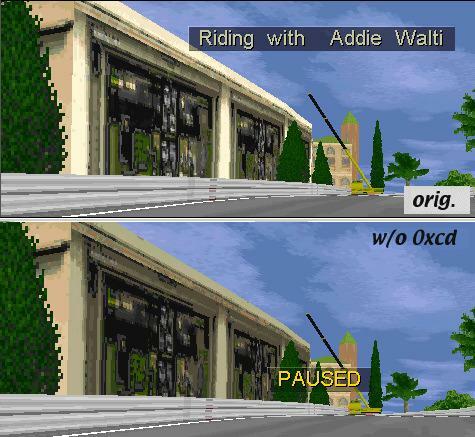 OO: cmd 0xd7 seems to control some factor at the pit exit, as it prevents you from seeing into the pits at its exit. This cmd enables the view into the pit lane from the track accoring to the setting of the 0xd3 cmd on a distance given by a1. If 0xd8 (216) is missing you see into the pit lane through the pit entrance. As soon as the entrance is passed, the pit scenery disapprears. But if you insert a 0xd8 it does NOT disappear ! Typically you insert a 0xd8 in the track at about the pit entrance, where the "two worlds" are connected. As a1 you enter the distance of the effect. Beware the distance has to be smaller than the remaining section of the track until the s/f line. If the remaining section is 40, like in original interlagos f1ct01.dat, the maximum a1 is 39, else the pit lane scenery wont show up at all. (In original interlagos a2 of 0xd3 in t88 is set to 42). After that i set a2 of 0xd3 in t88 to 72 and got the right screenshot in the image above. The pit lane scenery was only visible in front view. When driving in the wrong direction the pitlane scenery wasnt visible anymore. It was PA who turned my attention to this cmd ! MK: With this cmd you can "turn on" individual ribbons and banks depending on the value in argument a2. The banks are showing up no matter what detail level is set in the game. The ribbons only show up in medium and high detail level. ...and they remain textured whatever is set in the graphics-setup of the game. MK: The first argument is (as always) the offset into the sector. Set it to 150 to see it is. The second argument is a location code, type B from the table in the scenery tutorial [or in the glossary of this document]. The command SEEMS to switch off the selected ribbon, AND delete any applied textures to it for ~100 tracklength units BEFORE the command. I saw that when setting the offset to 150. Then, the first part of the track actually HAS texture applied to ribbon2, but then it disappears, and at the given offset, the ribbon itself disappears completely. Well, maybe not completely. The point were the ribbon disappears, shows a flash that indicates that maybe the ribbon is put to the other side, or zeroed. Of course, I don't know anything about why this command exists and works like this, it seems "shorthand" for two or three commands that should be inserted otherwise. Best bet is to remove the command I guess. I have a tendency to hate things I don't understand so I use that approach with most "unknown" commands. MK: I wish to emphasize that it was GN who came with the initial problem, and draw my attention (and surprise) with a first description. 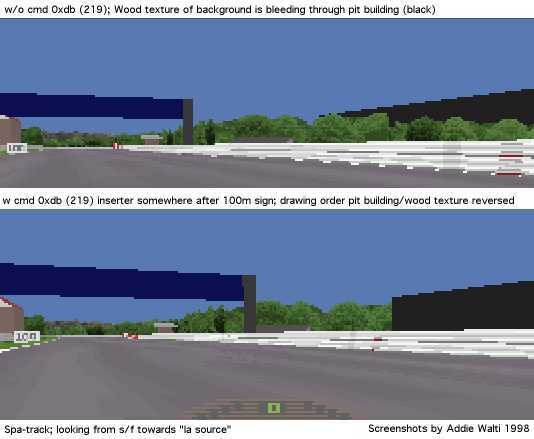 Cmd 0xdb (219) defines the sequence of drawing track- and pit lane scenery gfx. This cmd can be found (only) in the original Spa-track f1ct11.dat in t0. In spa you have a hairpin immediately following the s/f straight and after that another straight (towards eau rouge). Enclosed in these two straights there is the pit lane, the pit building in particular. It seems like the gp2.exe normally draws first the pitlane scenery, then the regular track scenery (covering appropriate part of pitlane scenery and objects). So in our case the trees of the right side of the straight after the hairpin would become pasted over the pit building. but here comes 0xdb. Cmd 0xdb (219) seems to tell the gp2.exe to switch the sequence of drawing there. its parameter seems to be (once more) an offset into the sector. 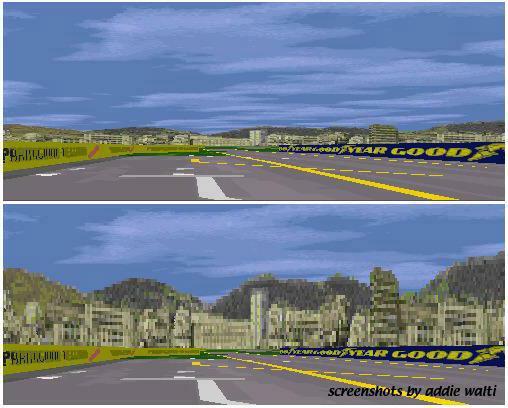 So with a cmd 0xdb (219), the gp2.exe first draws the regular track scenery beyond 0xdb, then the pit lane scenery, then at last the track where you are standing, if you are standing before the cmd 0xdb (219). You can check this easily by removing the cmd 0xdb (219) in the original Spa-track and then have a look at the pit building, standing in the middle between s/f line and hairpin. you just need the 0xdb when you have a layout of track and pit lane similar to spa. In all other cases do remove it (and save a lot of gfx-troubles) ! Not used in the original tracks. This cmd seems to discover amazing talents of inconspicuous cmds like 0xd2 (or 0xdc ?). If you insert a cmd 0xdd in t0 and AFTERWARDS a 0xd2 also into t0, you can control the overall grip on the track. Full credit goes to OO Obi Offiah ! The first working example was sent to me by MB. The argument of 0xdd and the first argument of 0xd2 seem to be of no importance (you can let them at 0). With the second argument of 0xd2 you can set up the grip level. MK: a2 is grip level. "normal" is 16384, if you want mega-grip, use 32767 (loews hairpin in 5th), if you want to try GPL, use around 11000. An icy condition is around 4000, almost zero drivability. 40000 - I wanna go for land speed record! not. I tested this on StwuLake, there's a nasty jump there where you can get 4 wheels off the floor if you want. But when I added the 0xd2 with a high value [e.g. 26000], the tyres stayed glued to the track! And that happens also when the car is pushed onto the track more, (while if it was the friction-coefficient that changed, you would still go in the air). But, I'm not sure whether it influeces the gravitational pull of the car (IE make the car heavier), or whether it influences all normal forces (therby also multiplying the downforce of the wings). I have stong suspicion it is the latter, it influences both the "mechanical grip" and the "aerodynamical grip"
MB: 0xdd is an evil cmd :) gp2 crashes when placing it in a pit sector and in a track sector it makes the car jumping in the pits. PH: Black flags are defined in track sector 0. they consist of flags on the left or flags (0xDE) on the right (0xDF). So choose the section you want to add the flag to. Commands 0xE1, 0xE2, 0xE3, 0xE4 and 0xE5 are valid. With 1 argument. But at least they have no visible effect. But cmds above 0xE5 are not valid. I tried those with args# up to 4, but GP2 crashed every time. So I think that 0xE5 is the very last command that is described in gp2.exe. 0xE1 - 0xE5 are described, but it is totally different matter, does it have meaning. 0xff (255) is said to mark the end of track data. Adding commands to track sections can be done a number of ways. The first is to left-click on the track section in the directory tree, and then right-click on it. This will bring up a menu and you can choose to insert a track command from here. The other way is left-click on the track section on the track map, and then go up to the TRACK menu and select INSERT TRACK CMD. To remove a track command, in the directory tree, left-click the plus (+) sign next to a track section, and left-click on the command that you want to remove. Then right-click on the command and select REMOVE TRACK COMMAND from the menu that appears. To edit a command, left-click on the plus sign beside a track section in the directory tree, and then left-click on the command you want to edit to highlight it. In the box at the bottom of the editor, the various arguments will appear and you can change then by double clicking on the value you wish to change. Otherwise, double click on the track command in the directory tree and this will bring up an editing box which is possibly a more user-friendly method. I prefer to copy/paste cmds most of the time. I look around in the neighbored track sectors for the desired cmd. If i see it, i select and then copy it (CTRL-C). I go back to my actual track sector, select its headerline and paste the cmd (CTRL-V). Afterwards i just adjust the arguments of the cmd to my needs. And for deleting a cmd i most of the time use the cut (CTRL-X) command. This is an attempt to unify the terminology between track-editing and the GP2 in order to simplify things. It is also an attempt to introduce some abbreviations, in order to shorten descriptions and speed things up. A lot of cmds do have a parameter saying how far from the beginning of the sector the cmd "happens". Sometimes this parameter is also refered as "Start" or "Length Into Sector". A sector is the smallest piece of a track. A sector has constant curvature and gradient change. Its length is measured in a unit of 16 feet (4.87m). In order to keep things simple and short, I use the abbreviation t for track-sector and p for pit lane sector. So t17 means track-sector 17 and p13 means pit lane sector 13. General term. Means some track-sectors in a row, sometimes with a common property. E.g. uphill track-section means some track-sectors where there is an uphill gradient. In order to unify the terminology in track-editing with the terminology that is used in GP2 we introduce the term Verge. It labels what was formerly known as bank. That means, with verge we mean the space between the track and the fences. This is also an "official" GP2 term. It labels what formerly was know as wall. This labels the space between the fences and the first ribbons. The last few terms will now be visualized in a screenshot of the Jerez-track. To especially visualize the new meaning of the term "bank" i switched off all textures but the these on the banks. In this screenshot on the right side of the track we dont see the ribbons. it doesnt matter whether you insert the positive or the negative representant of the value. If you would like to research for the unknown, maybe some hints could help starting you off. Basically think of it as a whole thing. The cmds and their arguments are just little pieces of it. So there is NO real weird stuff, everything fits in someway. Sometimes the solution is much closer than we are looking for. Sometimes we are looking for a solution too complicated. Remember, its a game-program for pc, so Geoff Crammond has had to simplificate things in order to speed it up. Figures 16384, 49152 or similar could represent an angle, see compass-chapter for details. Big positive numbers, e.g. 65438, also could be a low negative number: in computer programming everything is stored in bits and bytes. A typical storing-unit is two-bytes (16bit), also called word. In such a word you can either store a number 0..65535, that means 2^16 (2 power 16), such a number is called UNSIGNED or CARDINAL. Or it can be stored as a so called INTEGER number, -32768 .. +32767. But its the same two-bytes, its just a matter of interpretation. That means a certain number, say 65000, could be interpreted as UNSIGNED 65000, or as INTEGER -535; same two-bytes, different interpretation. So if an argument of a cmd has typical values 0..1000 and 64535 .. 65535, this actually smells like INTEGER: 0..1000, -1 .. -1000. Here the calculation: 0..32767 its the same INTEGER and UNSIGNED; 65535 downto 32768 you have to interpret as -1 downto -32767, calculation: integer:= unsigned-65536. The same two-word could also be interpreted as a bunch of bits. So if there are typical values 1, 2, 4, 8 or 16, etc. This could have to be interpreted bitwise. The first bit from the right is 1, the second 2 the third 4, the fourth 8, the fifth 2^5 (2 power 5), etc. e.g. have a look at a2 of cmd 0xcd, this looks like a typical two-word that has to be interpreted bitwise. -drawing-sequence 0xdb <> 0xd7 ? -view-distance cmds 0x81 (129), 0x82 (130), 0xbe (190) 0xbf (191) completely reworked ! -cmd 0xdb (219) description included, finally :) i discovered its meaning (partly) in july 98, but the info never found its way into the cmd-lib. shame on me ! -slight extension of type C location code table. -new entries 0xd4(212) and 0xd6(214). 0xd3(211) and 0xd5(213) brief description inserted. -additional procedures for dealing with cmds in the chapter "adding commands"
-set 0x94 and 0x95 back to unk and removed the whole content of the chapter. 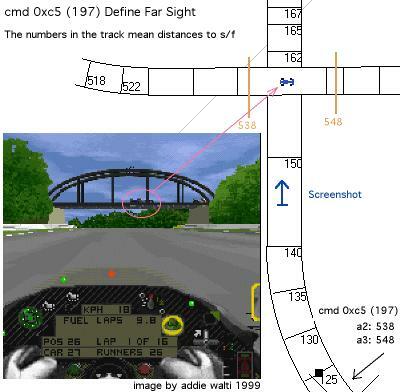 -new name for 0xbe and 0xbf "View Distance To Scenery ..."
-slight revision of cmd 0xc9: this cmd does not have to be neccesarily in t0 (as can be seen in the "classic-style" version of the bremgarten track. - Remove download facility, because there is now a general download facility at the tutorial page. - Changed the glossary entry of "offset" to "Offset Into Sector" in order to make it more intuitive. Then I also changed the labels of the arguments. - Major changes 0xb0, 0xbe, 0xbf, 0xd9, 0xda. - Adapting to unified terminology. (sector, verge, fence, bank). See glossary above. - Tried to make the lib more userfriendly by inserted some hyperlinks. - Revision of scenery cmds 0xaf(175) and 0xb8 ! - Unk chasing-chapter slightly extended. - Slight extension of 0x9b pit lane start offset. - Slight extension of 0xd0 by PH. - Slight extension of 0xbc by JV.